The Joker ride is being transformed from what was the park’s iconic and traditional wooden coaster Roar which closed on August 16, 2015. 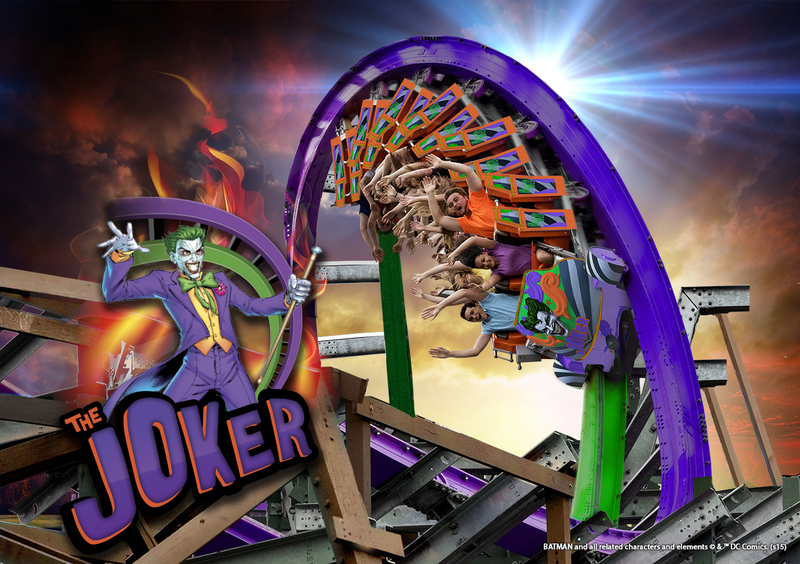 The Joker ride is scheduled to open in Spring 2016. For more information about upcoming 2016 Six Flags rides and attractions, including a video highlighting the new rides, visit www.sixflags.com/2016news. Six Flags Discovery Kingdom is also announcing the start of 2016 Season Pass sales with its special Flash Sale through Labor Day weekend featuring the best deal of the year – savings up to 65% off on 2016 Passes! September 3 through 7, guests will receive a free upgrade to a Gold Season Pass with every Pass purchased. Gold Season Passes include admission to Six Flags Discovery Kingdom and any other Six Flags theme park, as well as free parking and special admission offers for friends. 2016 Season Passes provide unlimited visits any operating day for the rest of 2015, including park admission to Fright Fest, Holiday in the Park and all of 2016. Follow Six Flags Discovery Kingdom on Facebook and on Twitter @sixflagsdk. DC Entertainment, home to iconic brands DC Comics (Superman, Batman, Green Lantern, Wonder Woman,The Flash), Vertigo (Sandman, Fables) and MAD, is the creative division charged with strategically integrating its content across Warner Bros. Entertainment and Time Warner. DC Entertainment works in concert with many key Warner Bros. divisions to unleash its stories and characters across all media, including but not limited to film, television, consumer products, home entertainment and interactive games. Publishing thousands of comic books, graphic novels and magazines each year, DC Entertainment is one of the largest English-language publisher of comics in the world.